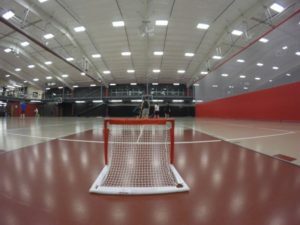 David Crawford, the recreation director at Saint Martin's University, played on the U.S. national floorball team last summer. Photo courtesy: Adam Troy. David Crawford grew up playing street hockey with his brothers. He has always been a hockey fan. So, three years ago when he learned about floorball, a game that is similar to hockey but not played on ice, Crawford was all in. 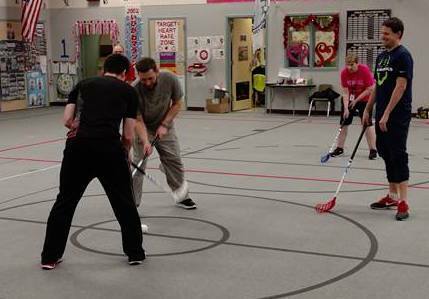 Now, Crawford, who is the recreation director at Saint Martin’s University, is passionate about sharing floorball with others. While the roots of floorball are in Sweden and Finland, Crawford first learned about floorball while on a business trip to Canada in 2014. His interest has become a passion both as a player and in sharing the game, telling others about a sport that is new to the United States. In his passionate attempts to share his new favorite sport, Crawford has put on clinics for North Thurston Public Schools, showing PE teachers the fast-moving game they could use in their gym classes. He has also coordinated two clinics for kids through the City of Lacey. And at Saint Martin’s University, he has made the sport available on recreation nights. David Crawford, the recreation director at Saint Martin’s University, played on the U.S. national floorball team last summer. Photo courtesy: Adam Troy. There are no floorball leagues in the state, but there is a group playing pickup games in Woodinville. “Other than that, there’s me in Washington,” Crawford said. Crawford’s passion is not just verbal. He is also good at playing the game. Last summer, he played on the U.S. national floorball team in Latvia. Floorball is a similar to ice hockey and is new in the United States. Photo courtesy: David Crawford. 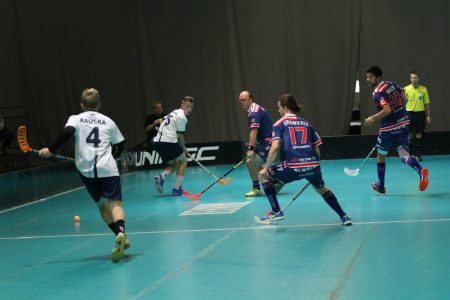 Floorball is played with sticks similar to hockey sticks that are a mix of fiberglass and carbon fiber. The grips look and feel like a tennis racquet grip. The balls are like whiffle balls. Crawford said one of the nice things about floorball is that the rules protect players from injury. Players are required to keep their sticks below their waist when near other players. You cannot grab the ball with your hand. You cannot lift your stick above your head. Rules focus on controlling the stick. David Crawford first learned about floorball in 2014 and is now passionate about the sport. Photo courtesy: Adam Troy. Floorball is fast paced. While there is contact in the sport, most of the rules are to avoid contact. You cannot hip check. You cannot body check as you can in hockey. You can shoulder someone, similar to soccer or basketball when you are jockeying for position over the ball. 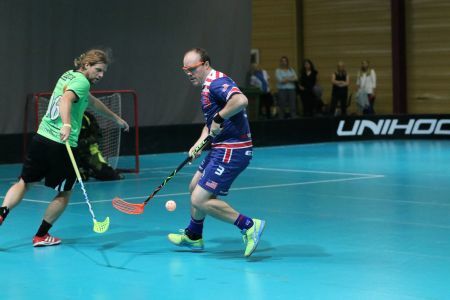 Crawford sees floorball as an alternative to other sports. Football, basketball, baseball, softball, volleyball and soccer reign supreme, but he says floorball can become something different, another option for the kids who are not starters in other sports. David Crawford is passionate about the game of floorball and he’s telling others about the sport. Photo courtesy: David Crawford. While floorball is like hockey, Crawford said what makes this sport more adaptable is you do not have to know how to skate. And you do not have to play it on ice. That makes it more affordable. In Crawford’s attempt to spread the news about floorball, he has launched a company called Floorball Guru. The purpose is to give people a resource to learn about floorball.